Regardless of the origin, when my buddy John and I decided to return from our morning walk along a different route from the one we normally follow, we discovered a treasure. John actually discovered it, stopping short and backtracking a few steps while my focus remained internal. Ideas for the 3-Day Novel contest I’ve entered were flowed freely this morning, plot ideas bursting forth with each new corner we turned. A fistful of pennies, one for every thought! With no pockets in today’s garb, I held the hefty coins in my sweaty palm until I made it home. I wondered who might find the rest, and if they’d even bother to pick them up. Pennies, 38 pennies. 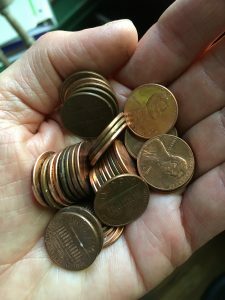 What do you do with 38 pennies? What does anyone do with pennies anymore besides dump them on the ground? I’ll toss them in our change container and maybe someday take the lot to one of those coin machines for paper cash. Better yet, I’ll save the 10% fee by spending an afternoon rolling the coins myself while reminiscing about my waitress days, driven by the anticipation of discovering the total amount I made in tips during my shift. Today’s windfall seemed like a sign from heaven that I’m on the right track with the novel I’ll write in 72 hours this Labor Day weekend. Glad my buddy was paying attention to our path while my head was in the clouds.